SwiftKey (left) and Fleksy apps for iOS 7. Swype, Fleksy, and SwiftKey, makers of popular third-party replacement keyboards for Android, have announced that they're working on custom keyboards for the newly announced iOS 8, which will be released this Fall. 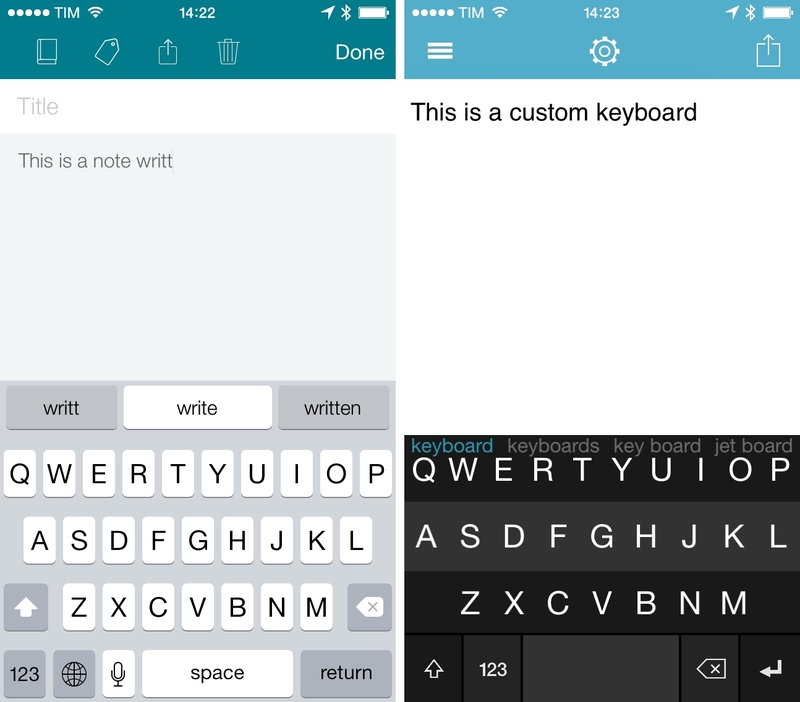 Fleksy, which launched an iOS app and SDK for developers to integrate with, has also confirmed with a tweet that they will be launching a custom keyboard for iOS 8. Auto-corrections aside, what’s really impressive is how the Fleksy keyboard actually works. As you type, suggested corrections appear in a thin line that runs across the top row of the QWERTY keyboard and Fleksy picks the best one for you; when it does, the mistyped word is replaced with the correction through a subtle green flash on the text. If you don’t like the correction, you can just swipe down with your thumb and pick another suggestion or swipe up and explicitly tell Fleksy to use the (likely mistyped) word. Cycling through suggestions doesn’t remove the space that Fleksy automatically adds after a word, and the system can also be taught words it doesn’t know (keep swiping up with one finger). On iOS 8, Apple is going to offer a new predictive and contextual keyboard called QuickType, which will deliver suggestions for 14 countries based on the app that's being used and whom users are writing to. By default, all QuickType language processing and learning will be done locally on a device, with no keystrokes or other typing information sent over the Internet. For third-party developers, Apple will allow apps to offer a system-wide custom keyboard as an extension. In this way, apps like Fleksy and SwiftKey that were previously limited to their own sandbox or had to rely on a proprietary SDK will be able to advertise their keyboard as a custom replacement that can be used anywhere on iOS. Custom keyboards can request network access, in which case sensitive information will be shared with an external web service; by default, network access for custom keyboards will be set to Off by iOS 8. SwiftKey Cloud is a suite of new services that gives you the ability to seamlessly backup and sync your personal writing style across multiple devices, creating a cloud-based hub for each user’s personal language profile. So if you get a new phone, or an existing device is lost or stolen, you won’t need to “reteach” SwiftKey all the words and phrases that matter to you. Plus, this means the kind of language you use with one device, such as your tablet, will sync automatically with your cell, enabling you to get the most relevant predictions with whatever device you use. Using powerful language analysis of major news stories and popular events, SwiftKey Cloud also updates the keyboard’s predictions with daily Trending Phrases. This allows users to discuss the day’s current affairs with ease. SwiftKey Cloud also makes it easier to personalize the keyboard based on online message archives, with an enhanced management console and new support for Yahoo! Mail. On its developer site, Apple has published a programming guide for custom keyboards, detailing the APIs available to developers and design guidelines for the best user implementation. Users will always be able to switch back to the default Apple keyboard, which will also appear for secure text input fields; custom keyboards with network access will be able to process keystroke data to provide autocorrect and suggestion features based on a developer's cloud resources, and they will benefit from the availability of data fetched from the web. The App Extension Programming Guide for Custom Keyboards is available here.